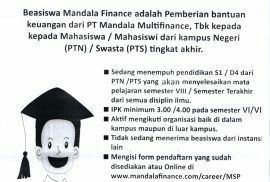 Pada tahun ini Ditjen Sumber Daya Ilmu Pengetahuan, Teknologi dan Pendidikan Tinggi kembali menawarkan Program Beasiswa Peningkalan Kualitas Publikasi Internasional (PKPI)/Sandwich-like bagi mahasiswa S3. 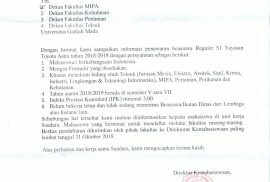 Pendaftaran dilakukan secara daring (online) melalui laman http://beasiswa.ristekdikti.go.id/pkpi/ yang sudah bisa diakses mulai tanggal 16 — 30 April 2018. Those who are interested to apply this scholarship, can directly contact the professors (listed below) according to their research interest to make an appointment for online interview. After the interview, applicants who are accepted by the professor to join the group can start the application from the system of the office of international education & programs http://oiep.thu.edu.tw/main.php. The current research directions we are conducting in our lab (laboratory of Advanced Materials and Devices Physics) are syntheses and assembly of low-dimensional semiconductor materials and its applications in solar energy harvesting, all-solid state Li battery and e-skin. Diumumkan, khususnya bagi calon mahasiswa S2 Prodi Fisika UGM, mengenai dibukanya Program Gelar Ganda (Double Degree Program – DDP) antara Departemen Fisika UGM dan Graduate School of Natural Science and Technology, Kanazawa University Japan.